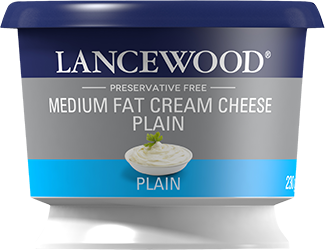 LANCEWOOD® Medium Fat Cream Cheese Plain is South Africa’s favourite cream cheese product, loved for its delicious richness and creaminess. It is a very versatile product and can be enjoyed as a snack on crackers, to add creaminess and body to pasta sauces and of course for delicious cakes such as cheesecake or for carrot cake icing. With no added preservatives, it is perfect for the whole family.